NMWA is one of 25 sites in D.C. with the chance to win up to $100,000 from Partners in Preservation (PiP), an initiative of American Express and the National Trust for Historic Preservation. Funds from this grant would help finance much-needed roof repairs—not so glamorous-sounding, but necessary—so that NMWA can stay focused on its mission of presenting and promoting fantastic women in the arts! With a history as varied as the museum’s collection, NMWA’s building is a work of art in itself. Designed in a Renaissance-revival style, the six-story structure embodies orderliness and civic grandeur. Constructed by one of D.C.’s most prominent architectural firms (and famed architect Waddy Wood), the building was received landmark status in 1984. 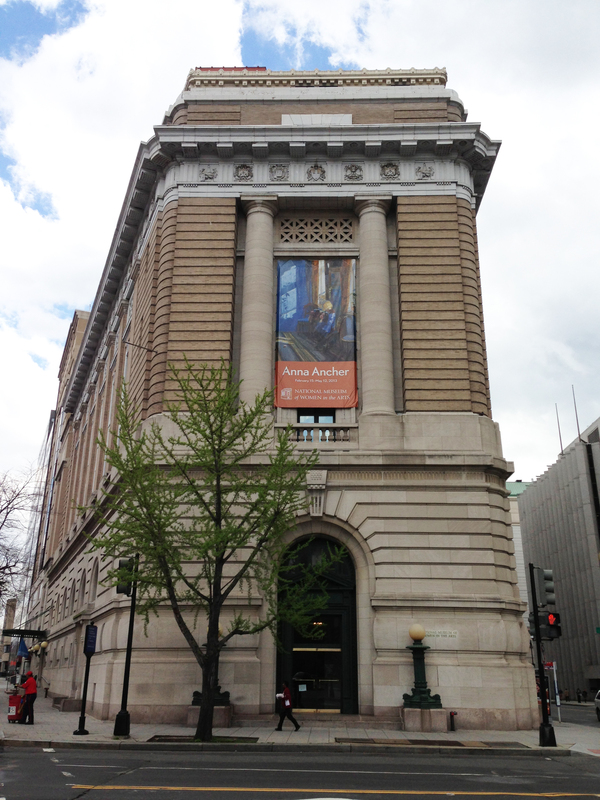 Purchased by NMWA in 1983, the building opened as a museum in 1987 after extensive renovations. Ironically, the building was originally constructed as a Masonic Temple—women were not allowed entry. 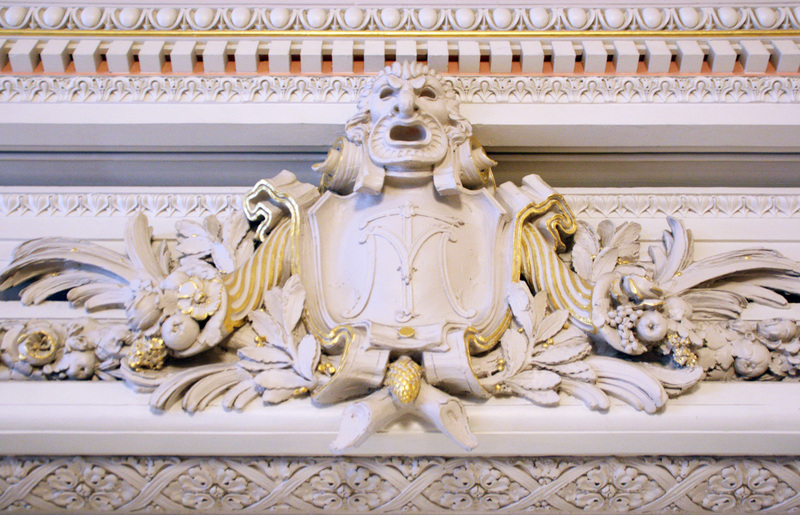 Masonic symbols, such as carved squares and compasses, can still be seen in the museum’s architecture. The clearest symbols are on the building’s façade, particularly those in a frieze above the fourth floor. Visitors may spot some vestiges within the walls as well. Before showing art, the building showed movies. In 1916, a first-floor theater began showing silent films. In the 1940s and early 1950s the Pix Theater ran racy “exploitation films” until resulting controversies caused their lease not to be renewed. Seven years later, the Town Theatre opened and played blockbuster films like Hitchcock’s Psycho until its closing in 1983. The wedge-shaped building was also home to several small offices and shops during its first 20 years. A dentist, an insurance agent, and a uniform supply outfitter all operated on the second floor above the movie theater. 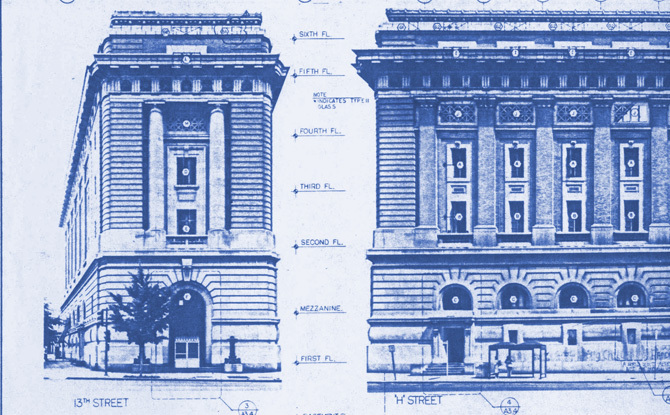 From 1910 through ’21, the upper floors contained George Washington University’s law library, and a USO canteen was housed in the basement during World War II. Although visitors can’t take advantage of the building’s previous functions by watching movies or getting their teeth cleaned, they can enjoy NMWA’s collection of art by many of the world’s most significant women artists. The building itself is seen as an embodiment of the museum’s mission—it is a place for women artists—and funds for vital roof repairs will ensure the continued integrity of its structure. Popular votes on social media will determine some of the grants. Voters can chime in for NMWA once every day by registering on the PiP website or logging in on PiP’s Facebook page. By using the hashtag #NMWA in Twitter or Instagram posts, and by checking in on Foursquare, voters can help NMWA earn extra points! Also, save the date! Drop by on May 5 for an open house and “Raise the Roof” with GirlsRock! DC! This entry was posted in Behind the Scenes, From the Vault, News and Updates, Public Programs by Women in the arts. Bookmark the permalink. The Nat’l Museum of Women in the Arts has given all women a clear sense of accomplishment and identity since women artists were overlooked since all the Middle Ages. These extremely talented women had their Coming Out Party with the opening of this fabulous museum. THANK YOU BILLIE HOLLADAY .